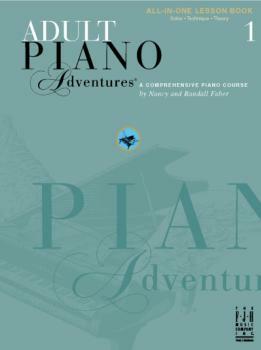 For adult beginners, use Adult Piano Adventures. This comprehensive, "All-In-One" book includes lessons, solos, technique, and theory in a single volume for ease of use. Book 1 presents the fundamentals of music notation, chord playing, and musical form ­ all through engaging music chosen specifically for the adult. Each unit includes a "3-Minute Technique" page to develop finger dexterity and a "Music Theory" page to develop understanding of rhythm and harmony. Contents include: Amazing Grace; I'd Like to Teach the World to Sing; Merrily We Roll Along; Ode to Joy; Yankee Doodle; Row, Row, Row, Your Boat; Clock Tower Bells; Catch a Falling Star; Russian Sailor Dance; Lean on Me; Chant of the Monk; Chant of the Monks; Shining Stars; Roman Trumpets; Camptown Races; Eine Kleine Nachtmusik; New World Symphony Theme; Jingle Bells; Procession; Theme from Surprise Symphony; Hungarian Dance; Matchmaker; French Minuet; Morning; Taps; Happy Birthday to You! ; English Folk Song; Gavotte; Simple Gifts; Moon on the Water; Star Wars (Main Theme); Reveille; May Dance; When the Saints Go Marching In; The Rose; Musette; American Fiddle Tune; Theme by Mozart; Half-Time Band; Over the Rainbow; Fiddler on the Roof; Sleeping Beauty Waltz; Summer Mountain Rain; Promenade (from Pictures at an Exhibition); Chinese Kites; Danny Boy; New Age Sounds; Aria from The Marriage of Figaro; Sixth Sense; The Lion Sleeps Tonight; Nobody Knows the Trouble I've Seen; Sonatina in C; Scale Waltz; Trumpet Voluntary; Can-Can; Tiger Rag (Hold that Tiger); Rise and Shine; The River; The Entertainer; Home on the Range; Chord Etude; Minuet in G; Bells on a G Scale; Alexander March; French Dance; Polovtsian Dance; For He's a Jolly Good Fellow; I'd Like to Teach the World to Sing; Music Box Etude; Don’t Dry for Me, Argentina.